I slept right through it! Hubby was kind enough not to wake me, he said he thought he might be dreaming, so didn’t bother to disturb me sleeping. Sweetheart. It was felt all the way into Mexico and north above L.A., so definitely worth feeling at our place. This entry was posted in Uncategorized and tagged earthquake on January 25, 2018 by Silver Willow. I agree…..non-event unless glass is breaking. Glad all was OK, SW.
yup. I'm very fortunate that despite living here for 66 years, never had anything break. My ex-in laws did during the Downey/Whittier one, though. And one of my aunts/uncles/cousin sets lived in Northridge for the original (1960's version) BIG one; their pool was sloshing water everywhere. I didn't even hear about that one! Glad you survived! Glad you slept through it. Nothing like a little adrenaline to keep you awake the rest of the night! Up here in northern California a 4.0 is pretty much a fun little shake. better you slept through it I'm thinking. yeah, I might have been to jazzed to fall back asleep…it's always a little contest to me when it happens, trying to guess the magnitude and how close. 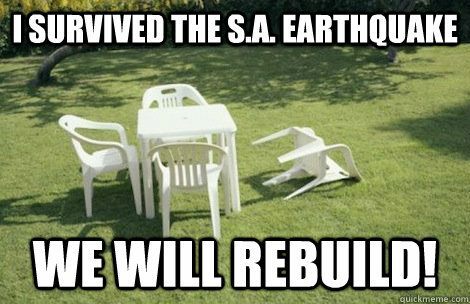 Oh well, the tremor, I bet many people slept through it.Strange to stand on the ground and one hits you it does feel strange, it's happened a couple of times to me in the past. I find that if I'm outside, I don't feel it nearly as much as when I'm inside. For that huge 60's quake, I was still in bed, and I remember holding on like I would if I was laying on a surfboard. Otherwise I would've been kicked out of the bed. It was that strong. And we were a full hour drive away from that epicenter! LOL at that photo! Don't worry, you'll feel The Big One! LOL.I've slept through them too. we were having them many times a day in the past few years. most were always under 5 though. a few were 4.8 or whatever.they were usually small but getting larger on the scale all the time. it was the frequency of them that finally got the attention on a grand scale.then the state stopped the big OIL from fracking all over it and low and behold!the earthquakes have stopped. at least from a noticeable standpoint. saw 'The Post' tonight with Streep and Hanks and thought it was wonderful.we have learned nothing of course re senseless political wars. the 'war on terror' is 17 years now and counting. so many lives lost for literally nothing.but our press is still free. made me want to learn more about Martha Graham. I am originally from a really earthquake prone city (Wellington, New Zealand) but now live in Auckland. We don't get earthquakes in Auckland but we do get them at our holiday home though and felt one the other night… really weird when I've lived away from earthquakes now for over 16 years. I hate them… always have and always will! It's the unknown… will this be a big one!! Perhaps, but more people have been killed outside of the war on terror, than in the war on terror…I'd like to see The Post. Might have to wait for Netflix. I rarely worry about that; like I said in an earlier comment, I tend to look at it like a game; how big is it/will it be? Where might it be located. Then find out (faster than ever…no more waiting 30 minutes to find out) how close I am in my guessing. Earthquakes give me the shakes. How blase' can one get? :)) Always impressed at the Californian acceptance of earthquakes. But then I once slept through an hurricane so I guess it is what we get use to.